SLENTRE.COM » SLentrepreneur of the Year 2010 Announced: Pat Wunderland! The votes have finally been tallied and the winner is Pat Wunderland. Thanks to all the SLENTRE.COM readers who voted for the SLentrepreneur of the Year 2010 and continue to support this publication. We are pleased to announce that participation in the election process doubled this year. We had twice as many Second Life residents vote and support their pick for the best SL entrepreneur. Other entrepreneurs that are worth an honorable mention included Rusch Raymaker and Candy Cerveau. Both of these savvy Second Life business women received a large number of votes. 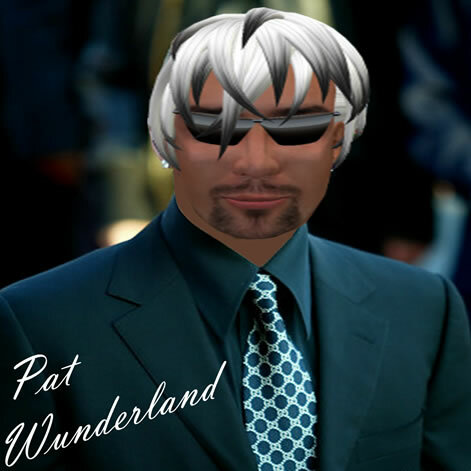 Pat Wunderland was kind enough to submit a brief biography about his Second Life activities and we have shared it with you below. Pat Wunderland has a passion for music and the people who create it. This is why he has spent the past four years providing professional services and products to the Second Life music community. Part of that passion is a burning desire to share. He created Wunderland Records in the spring of 2007 and has produced over 200 CD’s for over 100 Second Life entertainers. Spanning all genres and cultures, his record label allows residents to play and download music from their favorite artists while introducing the label’s roster of stars to fans screaming for more. In addition Pat’s LEMA Stream service allows venue owners, DJ’s, live musicians and anyone that just wants to have fun the ability to stream music into the grid. His servers, located in multiple data centers around the world, are 1000 mbps and are redundant and therefore provide fast, easy, reliable and crystal clear broadcasts to any parcel in Second Life. Over 400 avatars subscribe to LEMA Streams monthly service. LEMA Streams is recognized as the industry leader because they are always offering several plans at incredibly low prices that fit any budget . Pat’s island region known as Streams hits the mark for professional music products. His stores offer the latest and greatest in dance animations, instruments and animations for any member in a band, and tip signs and jars that are intuitive. Stages, lighting and effects round out the product line. In the heart of the region, Wunderland Records showcases the label’s stars with thousands of tracks to sample and buy. Could there be any more? You bet. Pat operates 3 live venues on his region. His Karaoke Club is popular with both the novice and the professional vocalists. On demand service 24/7 makes this venue bounce. Joining forces with LizAday Solo and golden Xenno the Saturn Club, dedicated to live performances, is an award winning futuristic venue that rocks and rolls. There’s more; Sherie’s Gaslight is considered by many to be the hottest live music venue in world. Producing over 40 hours of live music every night of the week for over 2 years, Sherie’s Gaslight is considered to be the best by Second Life’s top performers and their fans. With all of these ongoing and labor intensive projects you would think Pat has little time for anything else. You would be wrong. Perhaps Pat’s crowning achievement is best recognized by his annual Second Life holiday toy drive to benefit the Toys for Tots Foundation. In a little more then a year Pat has assembled and led a team of highly dedicated people that have raised over 5 million Lindens for this charitable endeavor making it the unchallenged leader in looking after less fortunate children at Christmas time. Pat’s method for business success parallels his real life core values, firm, friendly and fair. Add in a respect for the business process, its path and the end results for the client, the partners and himself. Pat Wunderland’s history and the legacy he is creating, his philanthropic ideals, along with a brain that is balanced between the rational and the creative makes him a logical selection as a finalist for the 2010 SL Entrepreneur of the year.